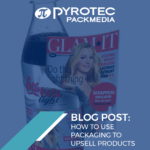 The world of packaging design is continuously evolving as companies refresh their designs to remain ahead of their competitors for promoting their products. Denny Bros – the inventor of the world’s first multi-page booklet label known as Fix-a- Form® – is world-leading print company that is locally represented in South Africa by Pyrotec PackMedia. In an increasingly busy and cluttered world, design simplicity can cut through the noise. For packaging, less is sometimes more. This year, we see the popularity of minimalist designs continuing as suppliers eliminate unnecessary elements from their packaging. The key to effective minimalist packaging is generating a design that people can relate to and that gets its message across with few or no words. Related to the quest for simplicity is the shift towards the use of bigger and bolder fonts. Fewer suppliers want small typography on their labels – instead they are opting for fewer words but in a bigger and bolder font. It’s an approach designed to help products stand out from the competition on shelf. We don’t always have to look for something new when there are archives of historical designs and styles that can be repurposed and repackaged. This explains why vintage and retro packaging designs are thriving. They’ve been appearing on packaging and labels for trendy alcoholic beverages for a couple of years and now also being seen on other products such as soap wrappers and tinned food. As well as looking great, vintage designs suggest a trusted brand – a reliable recipe that has been passed down through the ages. People are talking about a resurgence of pastel colours and we’re seeing more examples of this in packaging design. Light blues, pinks, peach and lemon colours are cool and serene – and maybe a reaction to some of the more bright and colourful designs that have come our way in recent years. Packaging designs using pastels have a calming effect – they draw us to them while still persuading us to take our time when opening them. As we become more aware of the impact of waste on the environment we see a definite societal trend away from too much packaging. In the UK, plastics are being replaced by biodegradable materials and around the globe, suppliers are reducing the amount of packaging they use wherever possible. 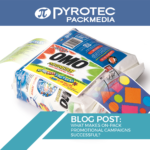 Looking at some of these trends, Pyrotec PackMedia is well-positioned to help suppliers improve their labelling and packaging designs through the use of the revolutionary Fix-a-Form® booklet labels. For instance, if a supplier wants to simplify a design, Fix-a-Form booklet labels® enable them to hide important information in the booklet, freeing up creative space. Likewise, Fix-a-Form® booklet labels enable companies to use larger typefaces or reduce their packaging by decreasing the amount of space required for product information. 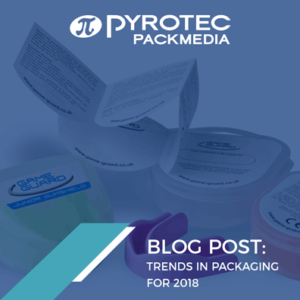 To find out how we can help you to use these design trends to promote your products, visit Pyrotec PackMedia today.